Heavenly is the only way to describe the classic Thai dessert khao niaow ma muang. It's the most famous of all Thai desserts, and so very scrumptious. The sticky rice is made in a pot on your stove. 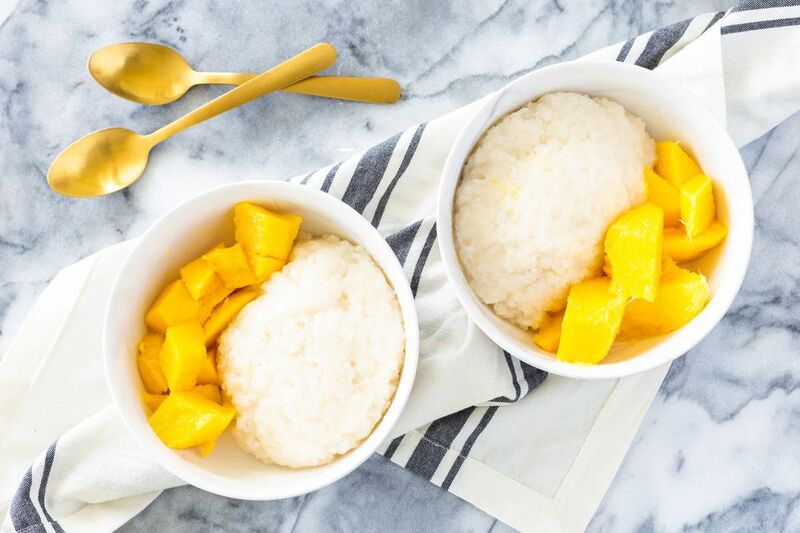 Just place some fresh mango slices over the sticky rice and smother with the easy coconut sauce, and the result is pure heaven! If you like mangoes and/or sticky rice, you're going to love this exotic Thai dessert. Soak rice in 1 cup water for 20 to 30 minutes. Do not drain the rice. Add 1/2 cup more water, plus 1/2 can coconut milk, salt, and 1 tablespoon brown sugar. Stir well. Bring to a gentle boil, then partially cover with a lid (leaving some room for steam to escape). Reduce heat to medium-low, or just until you get a gentle simmer. Simmer 20 to 30 minutes, or until coconut water has been absorbed by the rice. Turn off the heat, but leave the pot on the burner with the lid on tight. Allow to sit for 5 to 10 minutes. To make the sauce, warm (do not boil) the rest of the can of coconut milk over medium-low heat (5 minutes). Add 3 tablespoons brown sugar, stirring to dissolve. Prepare mango by cutting it open and slicing into bite-size pieces (see how to cut a mango). Scoop some warm rice into each serving bowl, then drizzle lots of the sweet coconut sauce over. It should look like an English pudding with custard sauce, with the rice swimming in sauce. Arrange mango slices on the rice and drizzle over more sauce. Enjoy! Be sure to get the right rice for this dessert: you need sticky rice, also known as "sweet rice." For even saucier rice, add scoops of rice (portion out 1 scoop per person) directly to the sauce pot and stir over low heat, gently breaking apart large lumps, but leaving smaller lumps/chunks. Then add the mango pieces and gently stir until everything is warmed through. Portion out into serving bowls, making sure everyone has equal amounts of rice, mango, and plenty of sauce. Top with any additional mango and sauce you have.